Unless something happens, and if this stinkin' internet here cooperates, I hope to have both 32 and 64 bit versions of Miyo-i3 uploaded to Sourceforge tomorrow.... LOL! I'll upload screenshots and the download link after they're available. Until then, I'm giving these bad boys a real testin' with some Trans Siberian Orchestra. Okay...the Miyo-i3 releases are now available. THE INSTALLER, LIVE USER NOTES, AND RELEASE NOTES ARE LOCATED IN THE DESKTOP FOLDER OF THE FILE MANAGER. PLEASE READ THE "LIVE USER NOTES" FOR INSTRUCTIONS ON HOW TO CONNECT TO THE INTERNET AND HOW TO CHANGE YOUR KEYBOARD LAYOUT IN THE LIVE SESSION. Miyo-i3 was made so that users could have a minimal and base system on which to add the software and applications that they choose. Miyo is simply an acronym for "make it your own". While the Jessie .isos were made in December 2017, I'm releasing them as 2018 releases. These versions of Miyo-i3 are based on Devuan Jessie. 1. 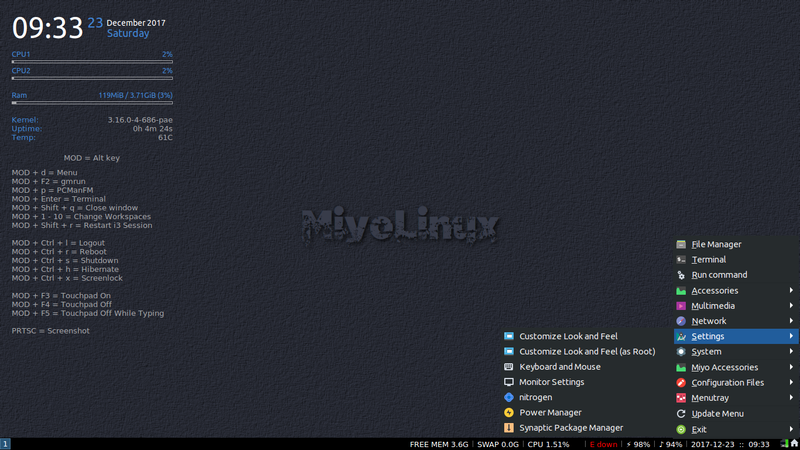 In addition to dmenu, Miyo-i3 includes gmrun and the Menutray menu. 2. This release uses Devuan's Amprolla3 repositories. 3. Logout, Restart, Shutdown, etc. are immediate...no warning dialog. 4. Number Lock is included but not activated. 5. Added a "Start Up" sound when the desktop loads. 6. Didn't include GUFW, but UFW is installed. 7. Didn't include an Archive Manager to allow users to choose their own. 8. i3Lock usage (for those unfamiliar with it). 10. Wallpapers are handled with Nitrogen instead of Feh. 11. Regarding the use of Compton. 12. For users who may want to upgrade to Ascii. 13. For users who would like the Update Notifier. 14. Keybinding for opening a web browser. 16. How to change the MOD key. 17. Volume Control on the i3bar. More information for each is given in the full Release Notes. By the way, I took dmenu (aka suckless-tools) from Ascii to give better font rendering in its menu. Miyo-i3 is light on resources, but you can make it even a little lighter by disabling Wicd in the system tray. If you install Miyo-i3, don't be surprised at how the installer appears on your screen...it's i3 after all, but the installer works the same. For those who have been interested in i3 but didn't feel comfortable trying it, my hope is that Miyo-i3 will help you feel at least a little more comfortable. i3 isn't for everyone, but it's certainly fun to use and learn. 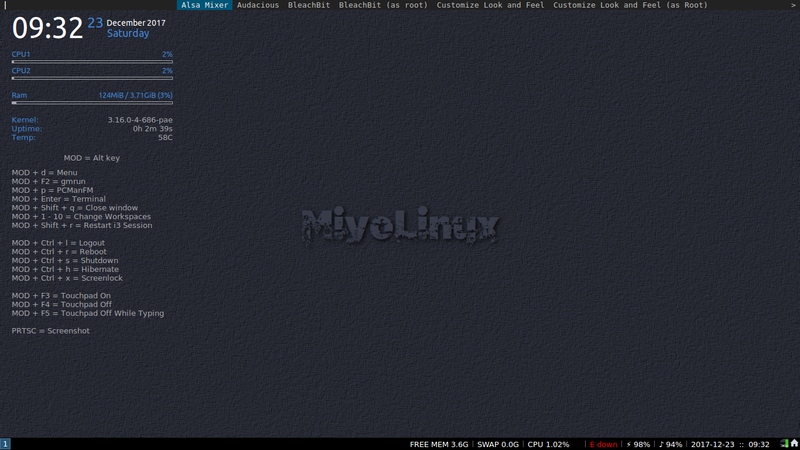 Miyo-i3 still tiles windows, but I've included the Menutray menu to hopefully make the acclimation a little easier. Menutray looks similar to the LXDE menu and/or the menu in MiyoLinux...it's made by the same developer who made Obmenu-Generator. Notes on how to use it are included in the Release Notes. Edited to add: The Menutray menu is the little icon in the lower right that looks like a little house. Just click on it to open the menu. Edited to add again: In these screenshots, I have my wireless connection commented out on i3bar...didn't want my IP showing here. The default is to show Wireless and Ethernet. Both show on the i3bar, but depending on which one you're using, the active connection will be green, and the other will be red and show Down...hence the "E down" in the screenshots...not using Ethernet. Finally, here's the link to where it can be downloaded. Have fun, and make it your own! Hey, Miyo . . . what a great video! Loved the music (tho a little dramatic) and your ever-present sense of humor. i3 looks interesting. Might try it if I weren't snowed under theming ascii etc. Wow. Thank you for the kind words ma'am! It's greatly appreciated! Kind of funny that you used the word "dramatic"...when I searched for music for the video, I used "dramatic" as a keyword! Whether you try Miyo-i3 or not, I sincerely thank you for your kind words. Take care! @ miyo This thread is nearly a year old. It took that long to check out various window manager/file manager/ascii combinations and end up back where I started. i3/pcmanfm/ascii-nice combo. I was put off by i3 complexity and keyboard shortcuts when I first looked at it but it is really growing on me. I only use my miyo disk to look through the files and help me with my own desktop built from the jessie minimal install. But I am grateful to have a reference and an interesting reference at that. Seriously-it helps. Belated Thank you! Thank you...that's one of the nicest compliments I may have ever received. I'm so glad to know that it's helped. Wonderful! You always make me smile. 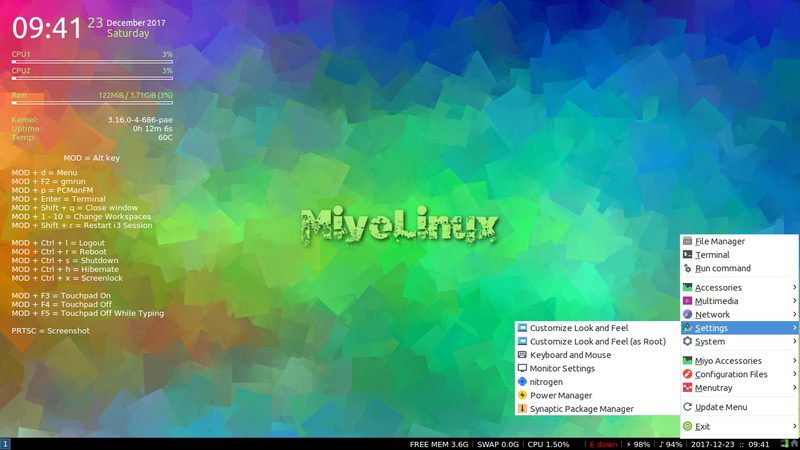 The new versions of Miyo-i3 are now available. 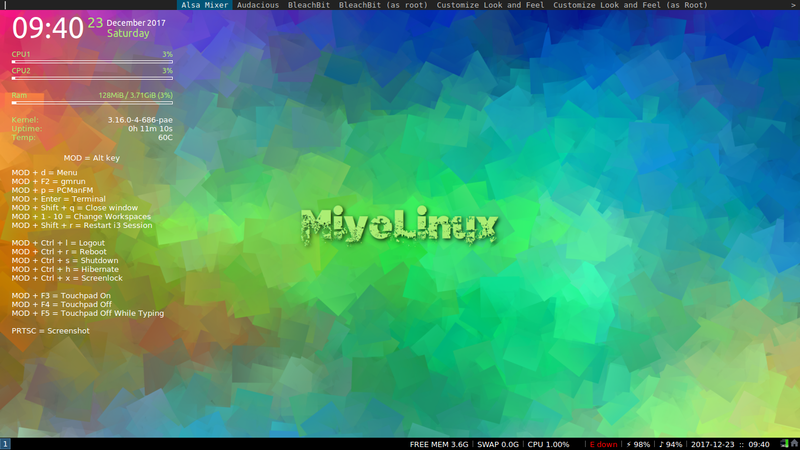 I've made a few improvements over the last release of Miyo-i3...I think. LOLOLOLOLOL!!! Thank you for your work on Miyo-i3! I am a happy devuan and i3 convert, and I have been looking for a simple installation medium to get me easily rolling with i3 for a while. Great work on this, and I look forward to leading others your way for their computing needs as well! Thank you for the kind words, and I'm really happy to know that Miyo-i3 is working well for you! It's always good to know that I've done something right. LOL! I do hope you enjoy using the system, and thank you so much for taking the time to let me know.